Newton, Kepler, Galileo, Kitcher, Leibniz. The New Science declares them “the giants upon whose shoulders the world of science stands.” They are the men that shaped the scientific world back in the 17th Century. Sure there were other scientists hard at work too but who wants to hear about them? These are the influential figures that we remember today, the ones who made breakthroughs and published their findings for everyone to behold. Now it’s your turn to play a key part in the scientific world. 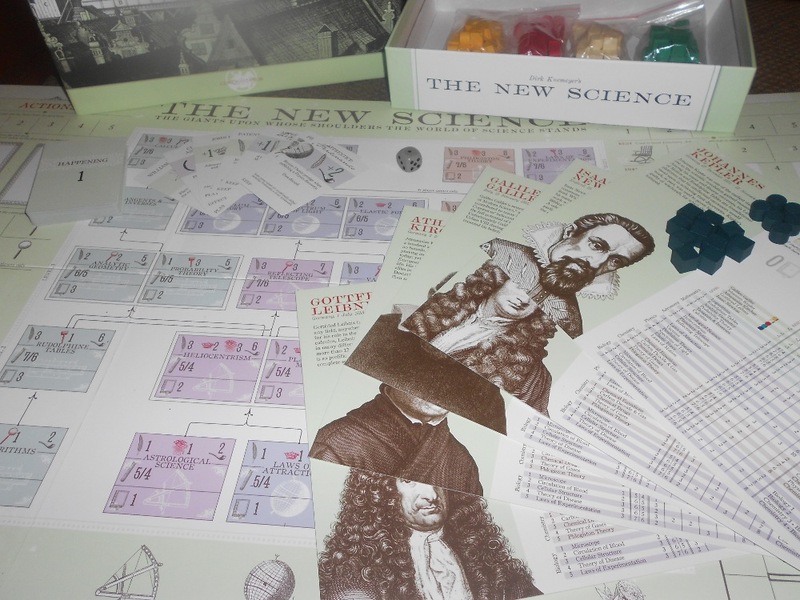 The New Science puts you in the role of one such giant during the scientific revolution. Pick your scientist and make sure to read their enlightening bio to get yourself into character. Some of them have happy stories (such as Netwon and Leibniz) but others had worse fates. Galileo was tried of heresy by Pope Urban VIII. Kepler’s work helped to prove his mother guilty of witchcraft. 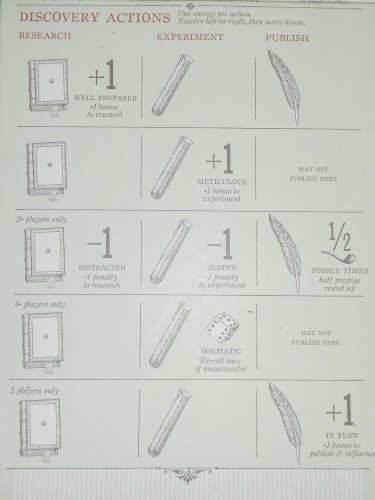 Kircher was described as “more quacksalver than savant” due to many incorrect theories. Take a moment before the game begins to marvel in your own brilliance or motivate yourself to overcome adversity by working all that much harder. Ready? Let’s do some science! Each scientist is talented in different ways and has influence in different circles. This is represented by bonuses to the various actions in the game as well as your starting influence in the game’s 4 main groups: Government, Religion, Industry, and Science. We’ll come back to what that all means shortly, just keep in mind that every scientist has their own strengths and will play somewhat differently. 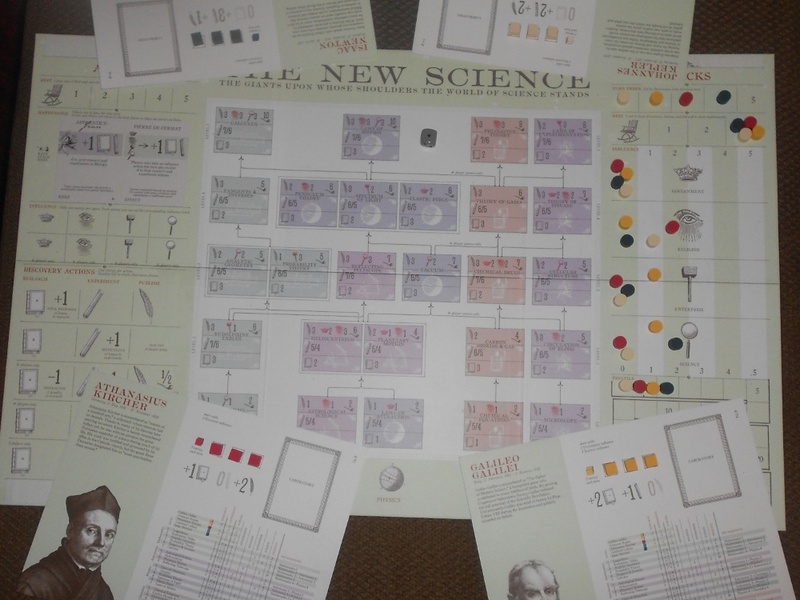 The main board has a large technology tree showing scientific Discoveries separated into five different branches of science: Mathematics, Astronomy, Physics, Chemistry, and Biology. You’ll begin your progress at the bottom of the tree, having access to one Discovery in each branch. As you move up the tree there are lines showing the prerequisites to be able to begin work on more advanced Discoveries. All prerequisites must be met (successfully experimented on) in order to move on to higher ones. There are also groups of Discoveries is several places. All of the Discoveries in a group have the same prerequisites and any one of them can be used to move up the tree. As a scientist, you’ll be seeking recognition for your hard work and set out to gain the most Prestige during the game by publishing these Discoveries. Looking closely at the tech tree will show that Discoveries have three different states of Progress: Researched (bottom), Experimentation (middle), and Published (top). You’ll start by reading up on the topic at hand, this is the Research that will build a foundation for your work. Next you have to perform an Experiment to verify your hypothesis and prove that you have a sound theory. Only then can you go on to Publish your findings, earning you the recognition and Prestige that you deserve. But publishing isn’t so easy, you’ll also need to have enough influence with the right people in order to be taken seriously. Each Discovery has a different requirement for what Influence will be necessary in order to get it published. But beware, other scientists will be seeking to publish their own experiments first or read your published works and use them to get a leg up on the next big breakthrough! All players are using the same tech tree and can see the progress that their peers are making in the assorted Discoveries. Publishing a Discovery will grant you Prestige but it will also unlock it for all other players, letting them use it to advance up the tree. It doesn’t matter who experimented on a Discovery first so you’ll have to decide how long you can wait to publish your Discoveries before someone else comes along and publishes it first! Racing up the scientific tree! 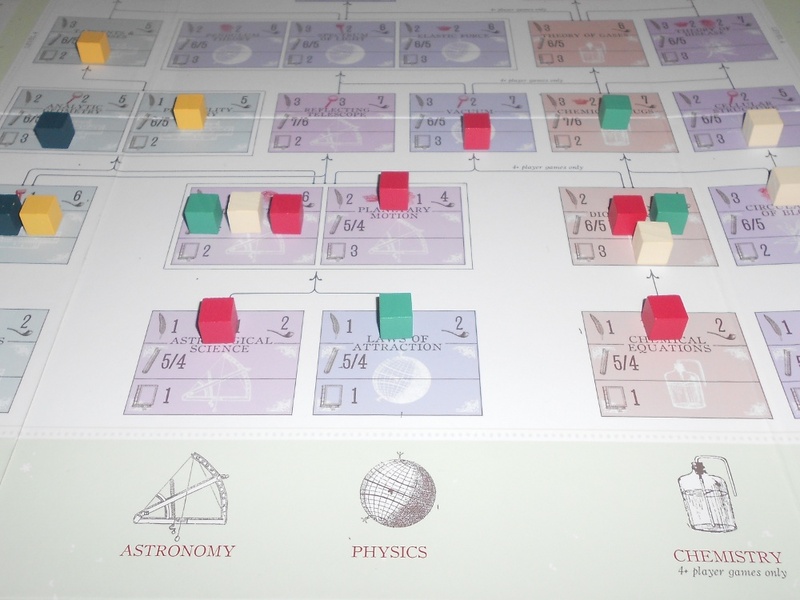 The New Science uses worker placement to simulate the various tasks that you’ll partake in on the long road to publication. You have a limited amount of Energy (three to be exact) that you can place on the board to plan your day. Players take turns placing an Energy cube on an action of their choosing, blocking that spot for the rest of the turn. 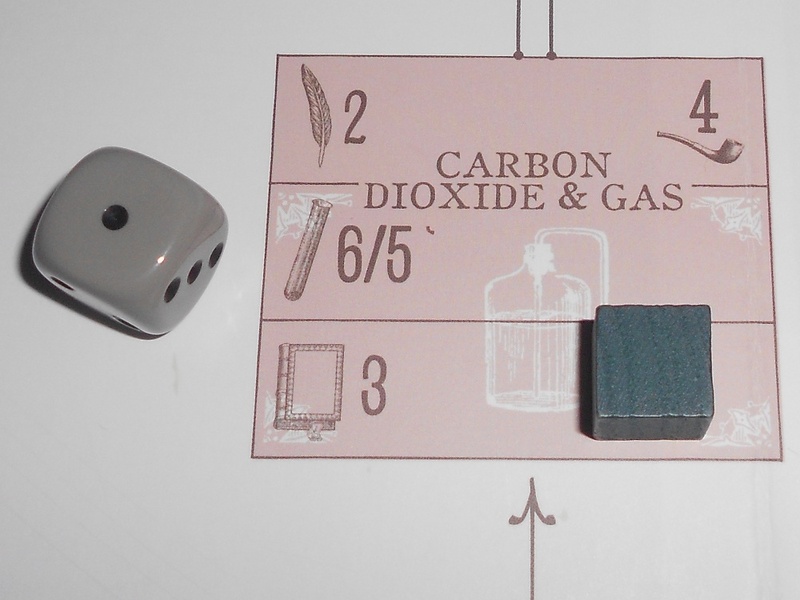 The board is broken up into several areas of actions and once players have placed all their Energy on the board then the actions are executed starting from the top area through to the bottom. The first area represents resting. Here you’ll be taking a much needed break to gather your thoughts and get an early start on the following day. In the Rest section there is a spot for every player and the first person to place there will be first in the turn order on the following turn. Any other players that rests will also be bumped up in the turn order based on the order that they arrived. The other benefit to Resting is that you will advance one spot on the Rest track, a sort of wildcard resource that can be used to increase your efforts in Researching, Experimenting, and Publishing. Next up are Happenings. 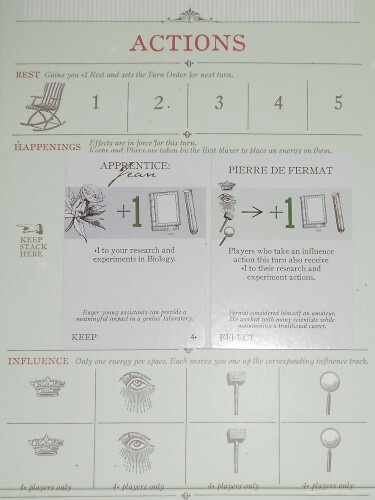 These are events, represented by cards, that change every turn to simulate the current state of the scientific community or meddling of other scientists. Some cards will simply change a rule for the current turn and others can be taken as an action to temporarily or permanently gain the benefit of the card. You can only hold one card at a time so you’ll have to pick careful which apprentice or what tools you’d like to assist you in your work. Once you’ve assessed the day’s Happenings you’ll get a chance to Influence the various groups mentioned previously. There are 2 action spaces for each group and placing in one of them will move you up one spot on the corresponding Influence track. As mentioned earlier, Influence is needed to publish certain Discoveries but also helps during certain events. Now that you’ve got your networking done you can finally move on to the day’s work. The last area is where you’ll be able to slave away on your Discoveries. There are five rows (using one row per player) each with a space for Research and Experimentation along with one for Publish in every other row. The rows are executed separately starting from the top with Research happening first, followed by Experiment, and then Publish. Some of the spots have modifiers to these actions, making it easier or harder to succeed. One of the Publish spots even halves the amount of Prestige you’ll get while executing it but since they are limited it can be worth it. When any of these actions are executed you’ll get to pick which Discovery you want to execute it on. Research requires the correct prerequisites, Experimenting requires a Discovery that has been researched, and Publishing requires one that has been experimented on. Each Discovery shows how difficult it is to perform these actions. You must match or exceed this value with your own effort in order to successfully perform the action. 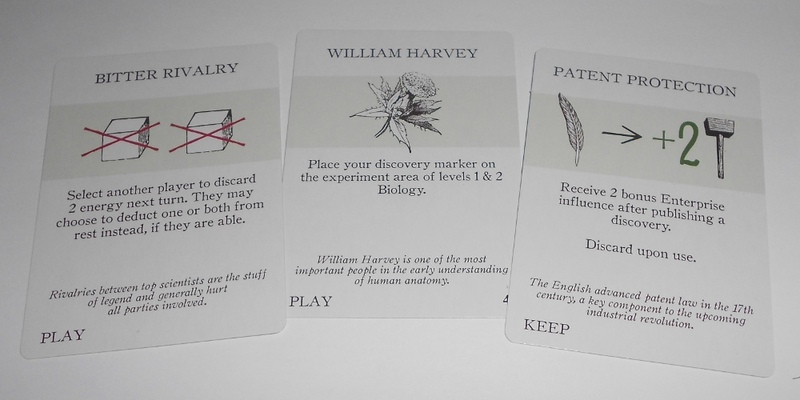 To determine your effort start with your scientist’s ability in that area and add in any bonuses from your current card and the action space you’re on (each spot provides a natural +1 simply for going there). One Rest may be expended to further increase this value by one. Experimenting is much more unpredictable so it has a higher value and requires you to roll a die and add its result to your value. A roll of one will always fail, I envision explosions regardless of the Discovery being experimented on. Careful with your mathematical equations, they could be unstable! Once one player has experimented on a Discovery it then becomes easier for later players. If you are successful, move a cube in your color to the appropriate area on that Discovery to show your progress. In the case of publishing, also gain the Prestige indicated and remove all opponents’ cubes as well as auto-publish all prerequisites (but don’t gain Prestige for them). After all the scientists are done with their work the day is through and Energy cubes are returned to the players. Place new Happenings cards for the following round and start planning your next day. This is repeated until all five of the top tier Discoveries have been published or until the round after you exhaust the deck of Happenings cards. 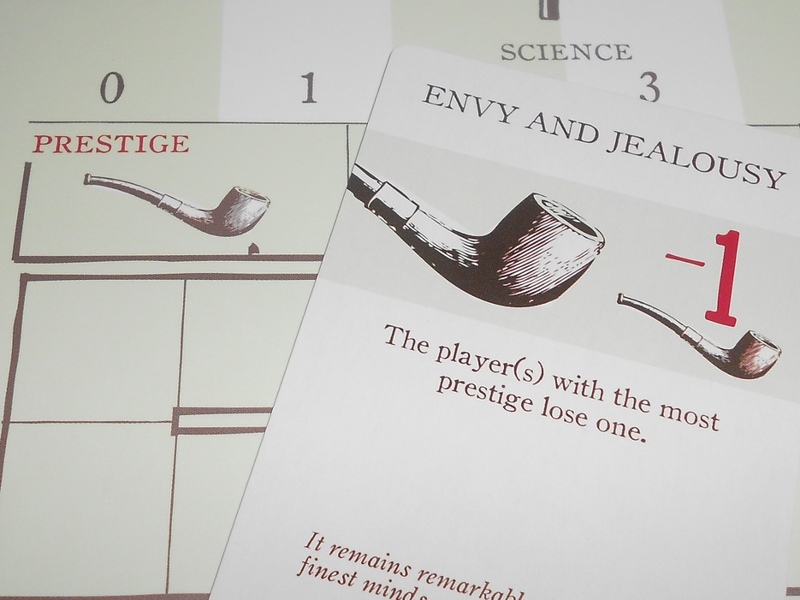 At the end of the game additional Prestige is awarded to the scientist with the most published Discoveries and the scientist with the highest influence in each group. Whoever has the most Prestige wins and becomes the first President of the Royal Society. Congratulations, you are now a giant of science! An Astounding Breakthrough or Failed Experiment? I’ll start off by sharing that I studied Math and Computer Engineering in college so I have a soft spot for science. I don’t know of too many games that broach this subject matter with this level of authenticity but The New Science is pretty much a science lovers dream game (if they are into euros). 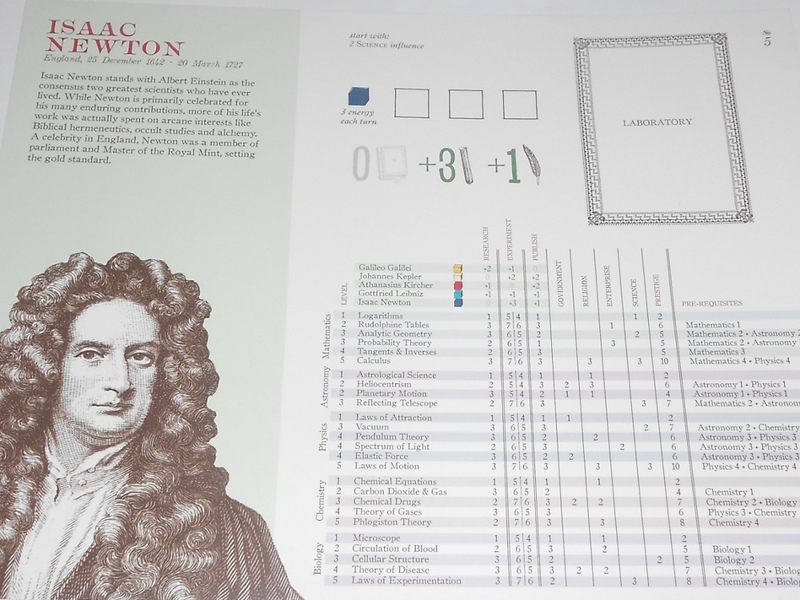 It delivers big time on simulating the setting, feeling, and superstars of the Scientific Revolution. This may sound boring to some but I’m absolutely serious when I say that every facet of this game absolutely oozes with theme. And this is coming from a guy who doesn’t normally care about theme but, as I said, I’ve got a soft spot for the subject matter. Even the flow of the game helps to reinforce the feeling of the time. Scientists were rushing to be the one to claim credit for something that they may not have been the first to discovery. The game is literally a race for the most important discoveries and the battle to publish them. Yet you’ll still need the other players to scale the tree. It’s a sort of selfish collaboration, you’re working together but still want to be the one to come out on top. Since you can’t experiment on everything by yourself you’ll have to ensure that you’re in position to benefit from the work of others. Withholding critical information is a tactic that was common to the time, you had to be careful to keep important discoveries to yourself so that you could get a leg up on your fellow scientists. Rivalries between players are common as you will be playing a bit of leap frog with the others, climbing certain branches together but going back and forth on who gets the credit. The happening cards in particular reinforce this by giving players a direct way to deter their opponents or literally steal credit for their work. During the game you will feel the excitement of uncertainty the comes with experimentation, the tension as you watch others research in branches that you hoped would remain uncontested, and the pride from publishing your greatest discovery. Simply put, you’ll feel the thrill of Science (I say this with the utmost respect)! Now that I’ve thoroughly gushed about how The New Science truly makes me feel like a 17th century superstar of science I’ll move on to actual gameplay thoughts. You’d probably like to finally hear a bit about that, eh? There’s a nice mix of worker placement and area control here. Because the workers are all placed before execution you get to speculate about where the other players are concentrating their efforts. Sometimes it’s pretty obvious but if you’re clever enough you might be able to sneak in and publish something before your opponent can react to it. The beauty of the action execution is that each row of Research-Experiment-Publish happens one at a time. The early rows can be used to claim key spots and the later ones can react to early contention or unclaimed discoveries. A Research action following a Publication can have access to areas of the tree that previous ones didn’t. There are also bonuses and deterrents on many of the action spots making those with weaker execution order more desirable. Like most good worker placement games there is a constant sense of tension in trying to plan out your actions not knowing which spots your opponents will grab. Since your actions aren’t executed until after placement you will have to be flexible with what you select. If you want to experiment but don’t have any researched discoveries then you’ll either need to pick a research action in a higher row or an experiement action in a lower one to ensure that both actions execute in the right order. There are actually many ways that your actions won’t come to fruition and during most games you will have various wasted efforts. If you want to feel like every action counts then this may be a big barrier to enjoying this game. This is simply part of the design and will appeal to some while being absolutely aggravating to others. There is an ever present element of calculated risk and you have to weigh your option while considering what opportunities are worth pursuing and which will likely be squandered. I feel like this fits nicely with the theme, sometimes you can spend a lot of effort experimenting just to watch someone else take all the credit. I like a lot of tension in my worker placement games and this one delivers on that pretty well. Looking at the area control aspect, the part that I particularly like is the balancing act between gaining uncontested access to certain parts of the tree and publishing for prestige but sacrificing your position. Publishing is the main way to get prestige so it’s not a matter on whether you’ll do it but when. I like that whenever you score you are helping the other players compete with you for future scoring opportunities. This not only prevents runaway leaders but adds a sense of cooperation in spite of bitter competition. This is the scientific community after all, working together for the common good but hoping desperately to be remembered for your work. The dreaded failed experiment, KABLOOM! I remember when The New Science was first announced I was very excited about it. I followed it closely until I found out that experimentation was going to be determined by a die roll. They said it was to create the feeling of uncertainty that reflects the very nature of experimenting. Sometimes you get lucky and sometimes things go terribly wrong. I hated the concept of this mechanic and immediately stopped following the game. Now, I understand that was a bit extreme but I have a bit of an aversion to a single die roll determining your fate. Roll a one and you just wasted your action, sorry! That’s how it looks on paper but in execution it absolutely succeeds in the intended purpose. Experimenting is risky, you have that sense of uncertainty and need to plan accordingly. This is how it works in real life and I like how the game reflects this. I had some games where I was plagued by low rolls but you just have to redouble your efforts and try again. Barely any actions are a sure thing and experimenting is no exception. Despite my initial misgivings I came to enjoy that dreaded roll, that bit of luck and anticipation at your results. Will you succeed or have to go back to the drawing board? It works great and I’m not sure if I’ll find another implementation that uses a single die roll so well. Another potential cause of strife are the happening cards. There are some that are downright nasty and that can be a big turn off to some players (or a big plus). Fortunately you are encouraged to remove these cards if they are a problem. If you don’t like that level of interaction then you don’t have to play with it but it’s there for those that want to kick each other around. I thought this was a nice touch to play to both crowds. Yes, that chart is confusing looking. No, you don’t need to use it. I did find that games tended to go a little bit longer than I was hoping, especially when players are first learning how to play and figuring out how to scale the tree. I attribute this to players’ ability to deal with uncertainty. You can spend a lot of time trying to figure out who’s going to advance where on the tree and when the ideal moment would be to publish but most of the time you’re going to have to be flexible and deal with lack of control. It can have the sluggish nature of both worker placement and area control games at its worst moments. If you know this going in then you can pick your opponents carefully and try to play with those that can maintain a brisk pace. I feel like The New Science has the ability to act as a decent gateway to worker placement games for your science loving friends but you’ll probably have to be careful not to teach a group of all new players at the same time. The enjoyment of the theme only goes so far when the game starts to drag out a bit with newcomers. If it’s not already exceedingly clear, I think quite highly of The New Science and its wonderful treatment of the excitement and tension present in the Scientific Revolution. There’s no denying the ever present theme and attention to detail throughout the game. While some may find the subject matter a little dry I find it to be refreshingly unique and nicely executed. The clever mix of worker placement and area control creates an ever present feeling of tension and uncertainty that perfectly reflects the setting. This is a near perfect game for your favorite science buff gamer friend.